Please choose a category, below, to access answers to your questions. Feel free to email support if you can't find an answer. Your question may help out other travelers, and we'll add the question and answer to this list. How do I contact someone if there is an emergency and my student is on a trip? Call the Educational Destinations Trip Tour Director's Cell Phone (last page of Trip itinerary booklet) OR our office at 800.616.1112. If you get a recording, follow the prompts to reach our 24/7 Manager on Duty. Travelers may use these numbers also. For more information, click here. Why do you send a Tour Director with the group? To provide professional tour management to your group's trip from beginning to end, which insures that you get what you paid for and frees group leaders to concentrate on educational objectives and to enjoy the travel experience. Can I bring snacks and beverages on the motorcoach? You may bring snacks and beverages (screw-top, plastic bottles only), as long as you clean up after yourself and treat the coach with respect. Are there electrical outlets and WiFi on the coaches? Currently, only a few coaches offer these features, so they are not guaranteed. As demand for these services increases, more coach companies will add them. Will the coaches have TV/DVD players? Many motorcoaches have Monitors and a DVD player, but they don't supply movies. Contact your director/teacher for approved movies to bring. Spending Money! How much should I send with my student? For “all-inclusive trips,” the only extra money needed is for souvenirs, snacks or other personal items. If your trip is not “all-inclusive,” you will be told (and your tour itinerary will state) those meals or tickets, etc., for which the traveler must pay on-site. A chaperone is an “always-on-duty” parent or staff member who is assigned to monitor and mentor students during a trip. Duties include being in charge of specific students, taking attendance at meeting places or on the motorcoach and administering (in some cases) medications, plus other responsibilities as directed by the director/group leader. When signing up for a trip, do I register as an adult or chaperone? Official trip chaperones are chosen by the director/group leader. If unsure, please register as an adult, and express your interest in serving as a chaperone to your director/group leader. She or he may change your classification once final selections have been made. How do I sign up for my trip online? Click on this link, follow the instructions, and sign up. Can my whole family sign-up for the trip? If the school allows additional family members to travel with the group, you may sign-up each member under one trip account. What are the benefits of signing up online? Not only will you have 24/7 access to all of the documents presented at the trip kickoff meeting, you may make free electronic trip payments, receive payment invoices and view trip messages and notifications. Standard maximum occupancy in U.S. hotels is four persons to a room, but some hotels accommodate up to six. Educational Destinations' standard practice is to place four students per room, unless the director/group leader indicates otherwise. Adults make their rooming request directly to the director/group leader. Are boys and girls rooms on the same floor? Educational Destinations always requests that boys and girls rooms be on separate floors. However, fulfillment of this request is subject to hotel room type availability. Chaperone rooms are assigned to each floor housing students. Will students have access to hotel services that could incur a charge? Educational Destinations asks hotels to remove access to pay movies and games, room service and outside phone service. Occasionally, some “pay-for” services cannot be disabled. In those cases, students and adults must pay the hotel for all charges they make. Most hotels have in-house security personnel on duty. Private security officers may be hired exclusively for the group for an additional charge (from $32 per guard per hour, with a six hour minimum). Guards are instructed to maintain a safe environment on student floors. They have no responsibility to monitor or correct student behavior. Do you arrange concerts for performing groups? How are the audiences? 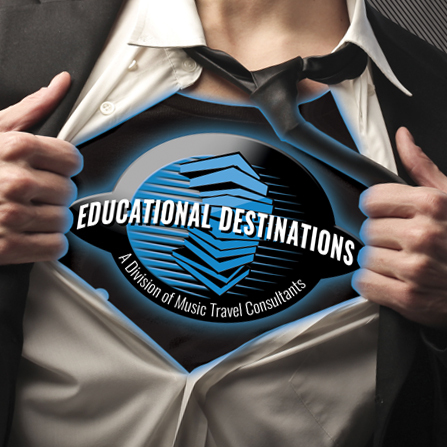 Educational Destinations assists in setting up and promoting concerts. Depending on the destination, the audiences are very good. There is a fee to arrange and promote most concerts, and performance venues often charge rent. Do we fly with all our instruments? Or, may we rent them at our destination? Airline baggage fees have made taking large instruments cost-prohibitive in most cases. Smaller instrument fees are affordable, and small pieces may be carried onto the aircraft free, as personal items. Within the USA and internationally, instrument rental costs are usually less than or equal to airline fees, depending on the number of rental days needed. Will my cell phone work outside the USA? Maybe. Because phone types and service plans vary, please check with your cellular service provider to confirm that your phone will work at your destination and to learn what usage costs will be. What if I lose my medications? Air Travel is part of our trip. What do I need to know? Personal Information must be submitted to Educational Destinations, including name on Photo I.D., full legal name, date of birth, and gender. If traveling internationally, a valid passport is required. Most group air tickets require a non-refundable deposit. Tickets, once issued, are non-refundable. Baggage fees apply to all bags on most flights within the USA. Internationally, no more than one bag is free. Security checks are performed before passengers are cleared for boarding, both in the USA and internationally. The Educational Destinations Tour Booklet contains specific information on baggage sizes and fees, and about what you may carry on board the aircraft. What is the Teacher's Resource Center? Accessible only by the Teacher/Group Leader, this secure information center contains up-to-date information about the trip, copies of documents and tools to make organizational tasks a breeze! Travel insurance? Do I need it? You want to insure against travel risks not covered by your family's medical plan or homeowners insurance. You want to supplement coverage provided by existing insurance policies. You want to cover the cost of high deductibles on your personal insurance policies. There is a risk that you might have to cancel your trip, before departure or en route, thus forfeiting a large sum of money. Always check with your insurance professional to be sure what your existing policies do and do not cover. Often, instrument insurance and international travel are not covered by homeowner's insurance or medical insurance policies. The payment schedule may be accessed by logging into your online account and clicking on the link to "Financial Information", then clicking on "Tour Conditions". I can't pay my deposit now. Can I pay in a few months? Unfortunately, we can't keep you registered for a trip without a deposit. When you are able to make a deposit and get caught up with your scheduled payments, please call us. If there is space available, we will add you to the trip. What's my final balance/trip cost? Your final trip cost is based on total travelers and room occupancy. Once we receive the final rooming list from your group leader (around 28 days before departure), we figure the final price and email you an invoice for your remaining balance due. Your trip's Tour Conditions page lists prices for different numbers of travelers, broken down by room occupancy. View it online by logging in to your account and clicking on “Financial Information”, then clicking on “Tour Conditions”. I have a traveler with special needs. What do I need to know? As you register for the trip, don’t forget about special needs your student or traveler has, like a physical limitation or a food allergy. When you share that information with us, we can explore options to plan the best possible experience for your family member. What are some examples of Special Needs? For physical limitations, please share anything that might help us plan. For instance, If walking all day for several days in a city is a struggle, let us know. While the group explores we may be able to arrange a location for you to take a break. If you get around by wheelchair, let us know. We want to ensure your foldable wheelchair will fit underneath the motorcoach. We may even be able to reserve a handicap-accessible motorcoach. Key Tip – Arrange for your traveler’s wheelchair companion from the group before trip departure. For travelers with cognitive disabilities, some amusement parks offer a rider switch program, which allows one person in your group to experience a ride, while another person waits with the traveler who does not ride. You can then swap places to allow the other traveler to ride without waiting in line again. Also, some parks offer an attraction guide that address specific triggers, such as flashing lights, loud noises, surprise elements, etc. Key Tip – Request cognitive disability information from amusement parks and other attractions early in trip planning. If there is a food allergy, it is important that travelers share the specific foods to avoid, as well as alternative foods. For instance, if you have nut allergies, list the specifics, (i.e. My student is allergic to almonds, hazelnuts, walnuts, and cashews, but not allergic to peanuts and pine nuts). If your traveler is a vegetarian, let us also know if dairy products, eggs, honey, and gelatin are eaten. Some vegetarians eat fish, but not beef, pork, chicken, or turkey. We contact our dining vendors to gather meal options and do our best to reasonably accommodate dining needs. For those who have food restrictions based on faith traditions, let us know your traveler’s specific needs. We will do our best to arrange appropriate meals. Key Tip – Let us know what you CAN eat, in addition to the foods that you cannot eat. Check the “Special Need” box in your registration. This is the best way to let us know that there is a specific concern. When the trip is moved from the Travel Designer stage to the Operations Department, your Operations Agent will reach out with an introductory letter to all indicated travelers. Reply to the Agent with detailed information by the posted due date. Key Tip – Be open. Be specific. What happens to my information before the trip? Your Operations Agent contacts vendors with specific requests. Once arrangements are finalized, Special Needs details are given to your Educational Destinations Tour Director, who reconfirms them and travels with your group throughout its trip. Receiving Special Needs details early allows us to plan the most appropriate course of action. Key Tip – Share information as soon as you receive your Special Needs email. It takes time to gather options and determine a plan of action. What can I do to prepare my Student/Traveler before the trip departs? Share the Special Needs of your traveler with music directors, teachers and chaperones. The latter are the traveler’s main ‘contact people.’ Also, the special needs traveler should be coached to be his or her own advocate, especially in situations when ‘contact people’ are not present. Educational Destinations Tour Directors manage pre-planned arrangements, answer traveler’s questions and handle adjustments. Maintaining open communication and working together to share information with all parties is essential for a smooth trip. Key Tip – Share your student’s Special Need with the Chaperone and Teacher. Do you have any tips for the rest of the group? Be patient – Someone may move a little slower than other travelers. The journey is sometimes more interesting than the destination. You may see something amazing that you would have missed otherwise and everyone will still participate in activities and events. Be flexible – When the unexpected happens (i.e. a meal is delayed, a ride is stopped to load a disabled traveler, etc.) take a moment, take a breath, and look around. This is a great opportunity to think about details you want to remember about the trip. Be kind – You will have a unique experience, but the same experience might be challenging for someone else. Can you help? Trips are more fun when you get to know the other travelers in your group better and share memorable adventures. Give travelers the highest degree of accuracy, care, responsiveness, and timeliness while providing the best possible tour. Create a truly fun experience that exposes our clients to and educates them about new places and cultures.